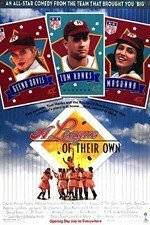 Crowd-pleasing comedy-drama with Geena Davis and Lori Petty as sisters from Oregon who become rivals when they join an all-woman's baseball league during World War II. Coaching the team is alcoholic former player Tom Hanks, and also on his team are the flirtatious Madonna and brassy Rosie O'Donnell. Jon Lovitz and Garry Marshall also star; Penny Marshall directs. 127 min. Widescreen; Soundtracks: English Dolby Digital 5.1, French Dolby Digital Surround, Spanish Dolby Digital Surround; Subtitles: Korean, Spanish. This virtual scrapbook is filled with articles, photographs, interviews, and statistics that give you an up-close-and-personal look at the pioneering women who played professional baseball from 1943 through 1954. Within these pages, you'll learn the true story of the athletes whose exploits inspired the feature film, "A League of Their Own." You'll also meet their managers, their chaperones, their batgirls, and even some of their fans. So warm up your clicking fingers and play ball!